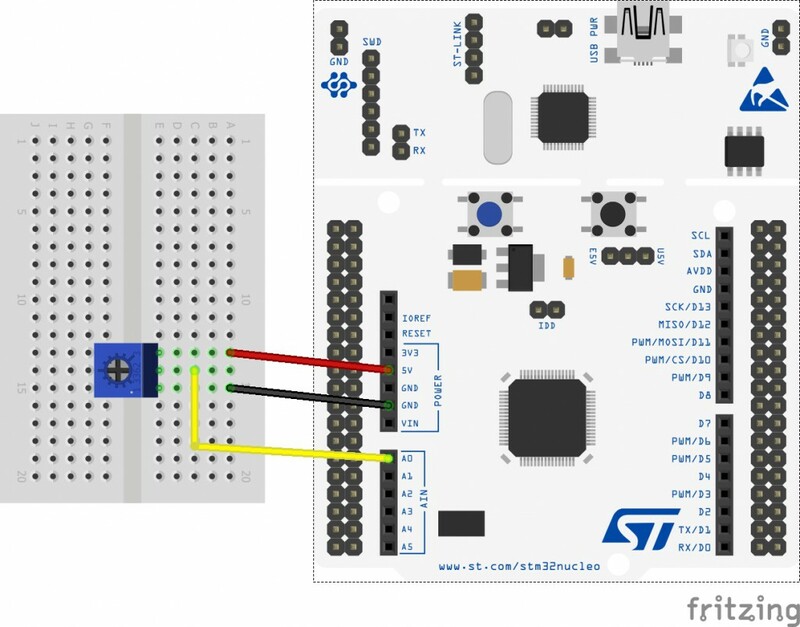 I have already written a tutorial about ADC in STM32 and how to use different methods to get values from sensors using ADC. But the CubeMx is upgrading very often recently and they are changing things a lot. So today I am writing this updated method of reading ADC values using all possible ways using latest CubeMx at the time of writing. I am going to read single channel first using all three methods i.e. Pollforconversion, interrupt, and DMA and than I will read multiple channels using the possible ways to do so. 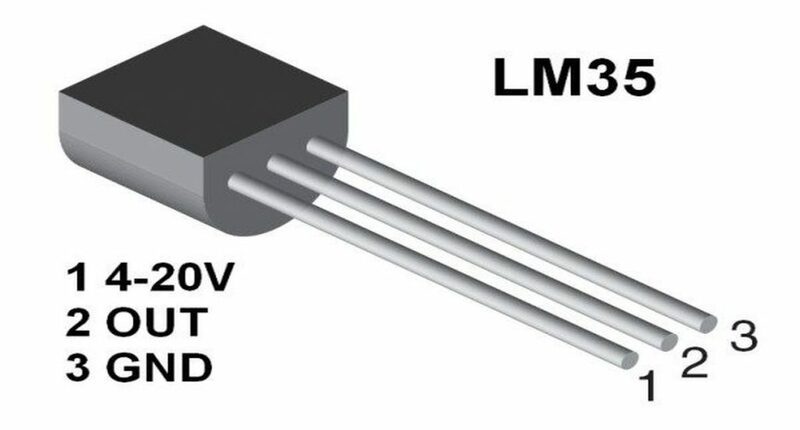 In Single conversion mode the ADC does one conversion and than stops. You can select single conversion in CubeMx by setting continuousconversionmode as DISABLED. In continuous conversion mode ADC starts another conversion as soon as it finishes one. This method is more efficient if you want to convert continuously. You can select continuous conversion by setting continuousconversionmode as ENABLED. This mode is used to scan a group of analog channels. This mode will be automatically selected if you are doing conversions for more than 1 channel. A single conversion is performed for each channel of the group. After each end of conversion the next channel of the group is converted automatically. 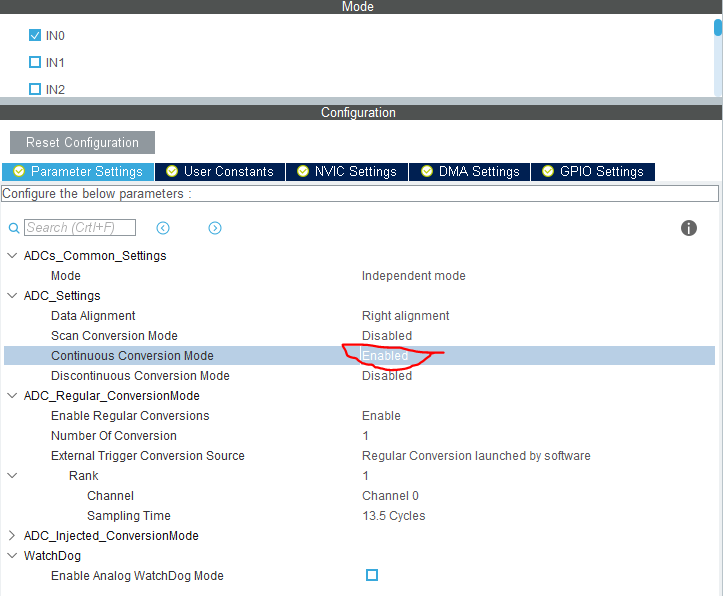 If the continuousconversionmode is ENABLED, conversion does not stop at the last selected group channel but continues again from the first selected group channel. 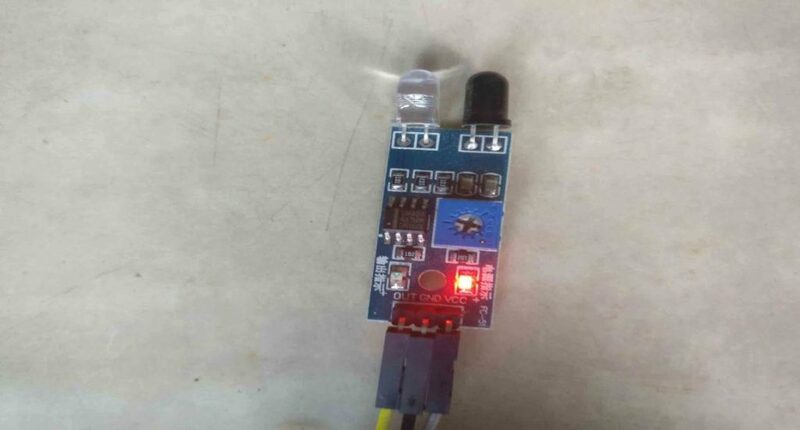 When using scan mode, DMA bit must be set and the direct memory access controller is used to transfer the converted data of regular group channels to SRAM after each update of the ADC_DR register. The setup of CubeMx will be as shown in the picture below. 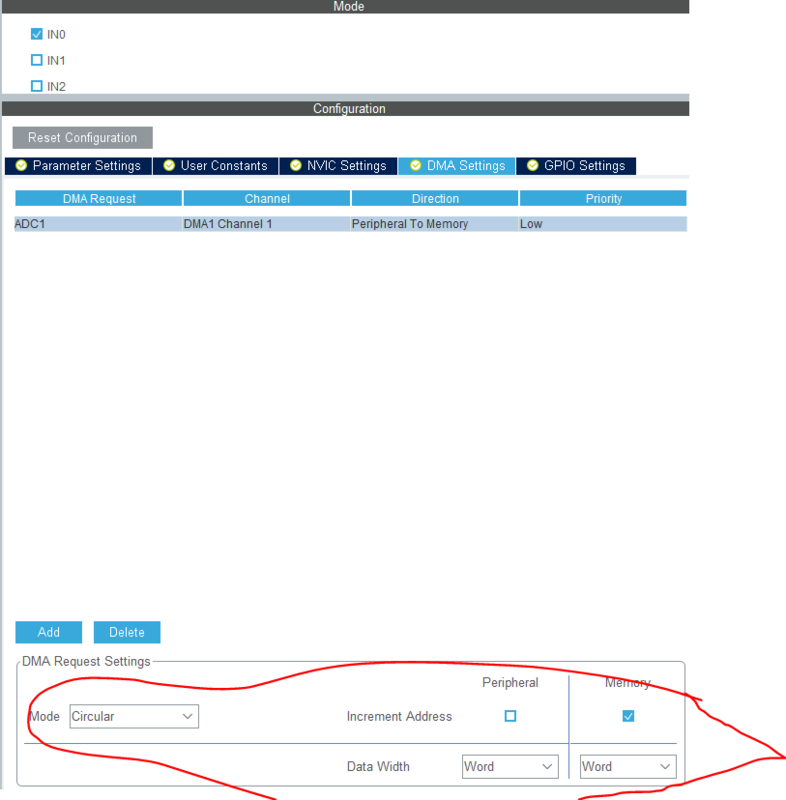 I am using only 1 channel and the continuous conversion is DISABLED. Also the sampling time is 13.5 cycles which is around 1 us, as the ADC clock is 12MHz. 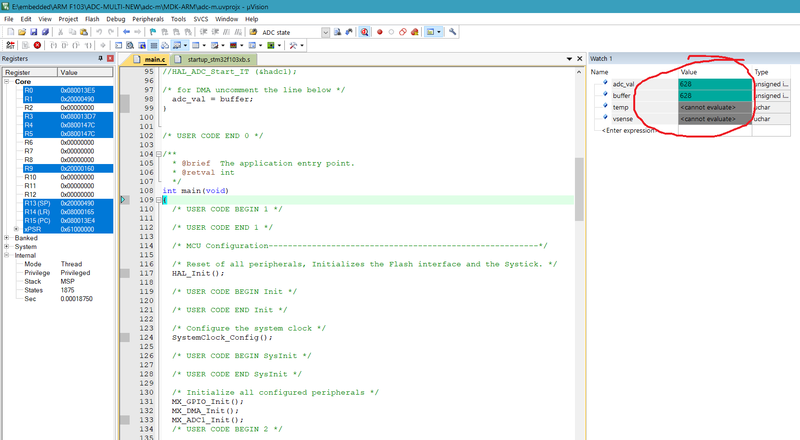 HAL_ADC_GetValue(ADC_HandleTypeDef* hadc) reads the vaue from ADC and stores it in the variable adc_val. Also note that if the continuousconversion mode is disabled, ADC will stop here and we have to again start the it in interrupt mode. DMA is another way of getting data from ADC. Like interrupt mode, DMA method also works in a non-blocking mode. That means we can use the rest of the program while the ADC would work in the background and when needed, we can get the value. Circular DMA mode will ensure that the new value will override the old one and this way it can continue to work as a circular buffer. Make sure the data width is selected as word. Because the resolution is 12 bit and only word can store the value here. This will start the ADC1 in DMA mode and the converted value will be stored in the buffer.